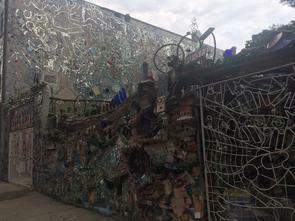 Philadelphia’s Magic Gardens (PMG) is an unmistakable institution on Philadelphia’s South Street. If pedestrians find the fantastical shapes and figures created by mosaicked mirror and tile familiar, it is because the artist has been decorating his neighborhood for over 40 years. There are over 120 public walls in the city that feature his unique art, many of which are in South Philadelphia. 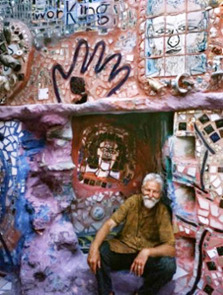 Isaiah Zagar, although raised in Brooklyn, was born in Philadelphia. He acquired his B.A. in painting and graphics from Pratt Institute and, as a student, found himself very inspired by outdoor art. After completing Peace Corps Service with his wife, Zagar returned to his native city. They settled on South Street in 1968 and opened a folk art store called the Eye’s Gallery. 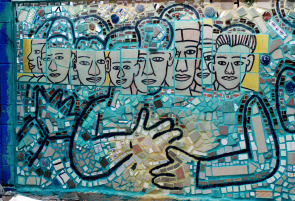 It was here that Zagar discovered his love and aptitude for mosaic, and he connected with his neighborhood by turning both public and private walls into pieces of art. In 1994 Zagar began working on 3,000 square feet of space in a vacant lot off of South Street. For fourteen years he created tunnels and grottos, built multilayered walls and mosaicked it all. When the owner of the lot had to sell, the community pitched in to make sure the artwork was saved. In 2004 it became Philadelphia’s Magic Gardens, a certified nonprofit organization. Today PMG continues the tradition of being a community organization. Programs such as “Afternoons with the Artist,” where visitors may converse with Zagar, and kid-oriented “Family Jams” keep the neighborhood involved and truly participatory in the institution. Many of these programs are multicultural to reflect the diversity of the surrounding area. Although Zagar’s work is spread throughout the city as well as featured in the Philadelphia Museum of Art, the Philadelphia Academy of Fine Art, and the Hirshhorn Museum, PMG illustrates both Zagar’s personal history and the mutual support between him and his neighborhood. It is a uniquely Philadelphian place.